Beautifully made. Great colors. Love this set! Give your bedroom a charming update with this coverlet set. Featuring an intricate paisley pattern in relaxing tones of grey, orange, yellow, and brown, the set offers unique elegance for any decor. The soft fabric and fill ensure a cozy night's sleep. The bedspread and pillows are very pretty and good quality. This set really warms up my guest bedroom. Love this set. As described. Really pleased with this comforter ... lightweight and not at all stiff or cheap feeling. 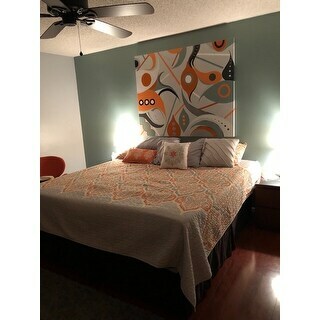 Orange in pillow is bright; other colors a little more muted, which is perfect. Only took off one star because a few extra inches both on the sides and at the foot would have been nice. For the price, an excellent choice. This is the second bedding set I've purchased. I love the accent pillows that are included with the quilt and shams. 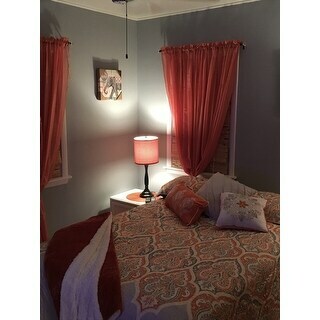 The orange and silver colors in this set provides a bright, cheery look for the guest room. The coverlet is so very soft and comfy.. This coverlet set is beautiful. I really like the pattern--a mix of modern blue/grey hues perfectly paired with an energizing orange. It brightens up the bedroom nicely. The pillows are nice too, but just for decoration. The weight of the blanket is nice--not too thick and not too thin. If there was an option to buy the coverlet without the pillows, I would choose that. Coverlet and shams have held up well to frequent washings, and withstand my three cats without developing snags and pulls. The decorative pillows are the typical, super cheap ones they include with such sets (I donated them to Goodwill), but do well enough if you're not super fussy or if the set is for a teen's room or guest room. Beautiful coverlet at an affordable price. I ordered a king size for my queen size bed to make sure the sides would be covered. The pillows were too big; I had to alter them to fit the queen pillows. My bed looks so nice now. I'm really happy with this coverlet. Color doesn't fade with washing. Many times the sides of the quilt aren't quite long enough, not the case here! Great fit! This is the only comforter sets that I buy. I have several coverlet sets and have never been disappointed. They are well constructed and very soft. They hold up to loads of washing and never fade, wrinkle, or shrink. They dry quickly, which is an added bonus. You can't find a better bargain. They look a lot more expensive. I always get compliments on them. We have the California King set. It is a great weight for summer and we just add a blanket under for winter. Very happy with this product. Love that it is quilted cotton. It's bright and beautiful! Colors are beautiful and quality is great! Very happy with this purchase. Beautiful set, and machine washable, which is a plus for me since one of our dogs likes to sneak and jump on our bed. It is a bit more casual than what the pictures show and not as wide as I would’ve prefer for a nicer drop, but still looks great. 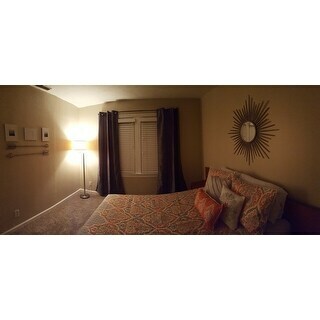 Love the look, it had 5 star reviews and it fit my budget.